Jagruti's Cooking Odyssey: Badam Salted Caramel Mawa Malai Peda - Almond Salted Caramel Creamy Fudge ! Badam Salted Caramel Mawa Malai Peda - Almond Salted Caramel Creamy Fudge ! "Commit all your crimes today because even GOD is watching this match" , and I committed one ! Alarms were set to wake up as early as 3 am, also checked not once but twice that they were definitely set, also the recording was set on the sky box in case anything gets missed. Food arrangements covered so no distractions and other chores were almost forgotten. While prayers were going on in our minds, patriotic songs blared out of the music player in the JCO household last Sunday. The four-year wait of this cricket world cup has ended and it has started with a bang ! it is to anticipate that though this is one of the finest and most watched around the globe sporting clash, cricket fans eagerly await and discuss this mouth watering world cup match between arch rivals India and Pakistan. Obviously, we all go through lots of excitements as well as the tensions when we offer blind support to our respective team ... Dad told me that on this day this match brought almost all activity in India to a halt and sent the country into a revelry when it was over. Particularly this match was watched by an almost billion people around the globe and win was celebrated with glory. We were relieved when India thrashed Pakistan to launch world cup campaign in magnificent style and maintaining their magnificent record against Pakistan by winning the sixth consecutive World cup game since 1992. 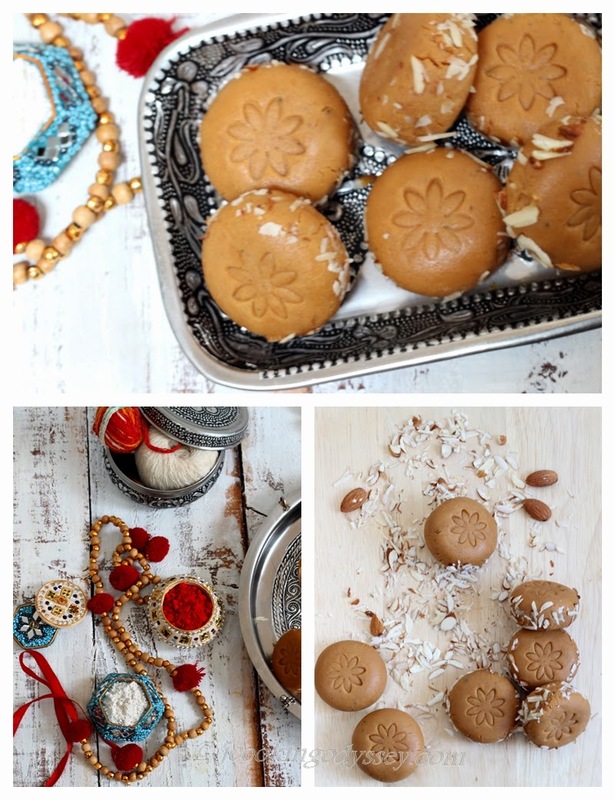 India's win against Pakistan in cricket meant only one thing to us...Indian Mithai with a magnificent style too! Pedas are my all time favourite mithai, I adore them most, soft, milky and aromatic pedas always makes me happy, I could never stop at one. I could trade any western fudge for these because they will bring same deliciousness and make my taste buds dance! I always experiment in making peda with lots of trials and errors to discover new flavours my obsession for my beloved sweet peda. If you are looking for a few more variety or flavours for Peda, you are on a right site, sit back relax and check out Ricotta Cheese peda, Tri colour peda, Mango Peda , and Mawa peda on JCO . Ideal for Mahashivratri Prasad or Farali food ..which is today. Heat ghee in a heavy bottom pan, keep the heat on a very low flame. Add grated mawa, milk powder and keep stirring and pressing the mixture with the spatula, after 3-4 minutes add almond meal and roast another 2-3 minute. make sure nothing stick to the bottom of the pan. Pour cream into the milk powder mixture and keep stirring for 3-4 minutes. Now add salted caramel and keep stirring. Simmer the mixture, same time keep stirring. After few minutes, you will see the peda mixture starts getting thicker and leaves the edges of the pan and mixture becomes a one mass. Rub some ghee on your palm and knead the peda mixture once or twice. Form equal size of balls and flatten them slightly. or give them a shape of your choice. Also, you can give them some imprints or design. Roll each peda on their sides in a flaked almonds or garnish on top. wat a fantastic preparation...gorgeous cliks..